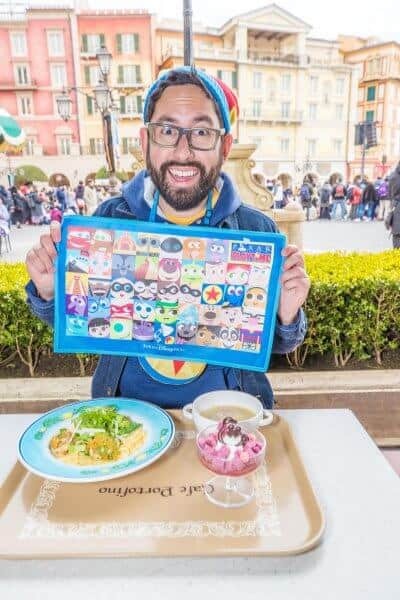 Pixar Playtime is a special winter event at Tokyo DisneySea that runs from January 11 through March 25, 2019 (see full details here). 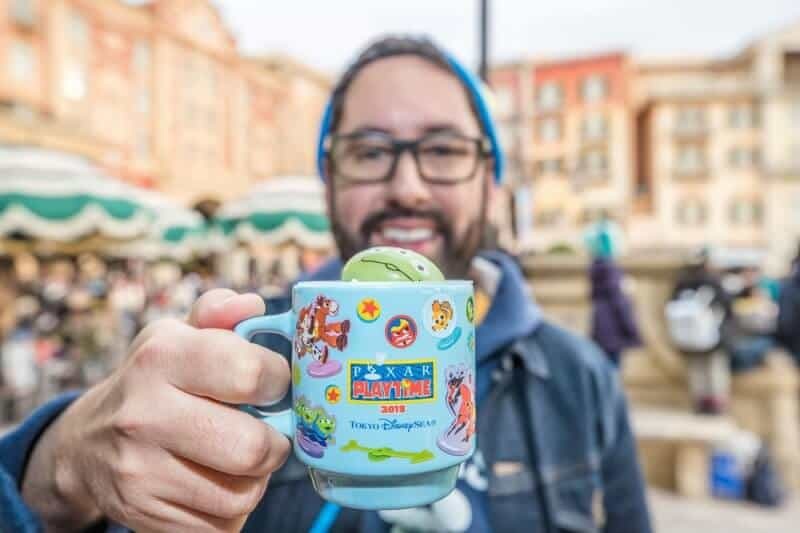 Our Pixar Playtime food guide helps you decide which food items are worth it (and which ones aren’t), including a close look at all the adorable souvenir cups and desserts. For prices check our earlier posts. Don’t forget to plan the rest of your trip to Japan with our free and premium travel guides. They are essential tools for planning a stress-free trip to Japan. Before we start, I want to warn you not to read this on an empty stomach. It’ll leave you wanting to book a trip to Japan immediately. Everything I mention here is also on our YouTube Channel if you fancy watching me stuff my face. 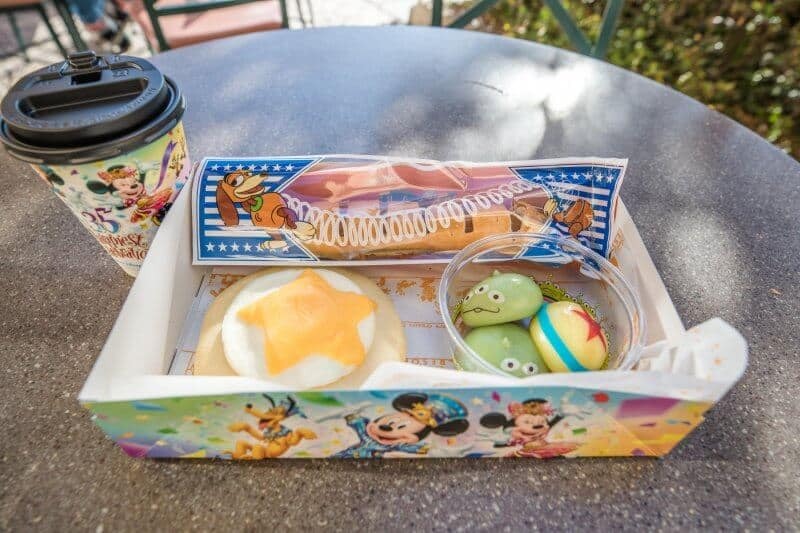 Thank you to Tokyo Disney Resort for providing some of these food items for review purposes. Read our full disclosure here. 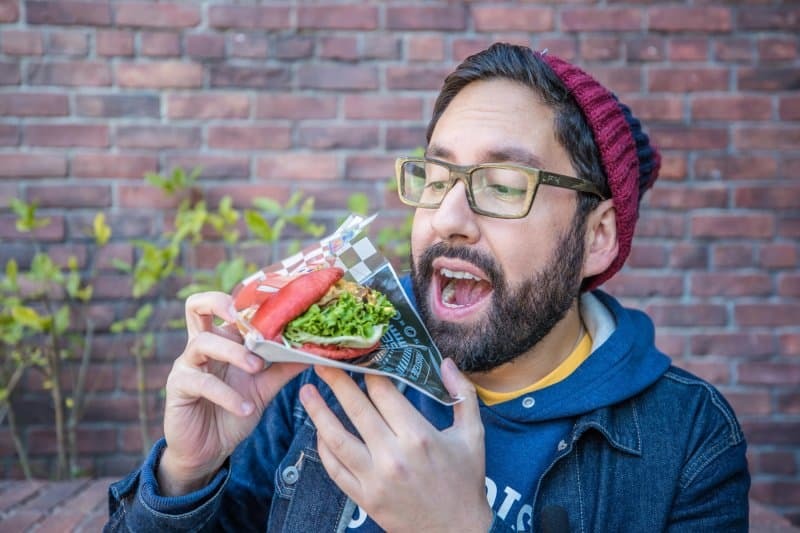 Use our interactive map on Stroly to help you find all the food while you’re in the Park. 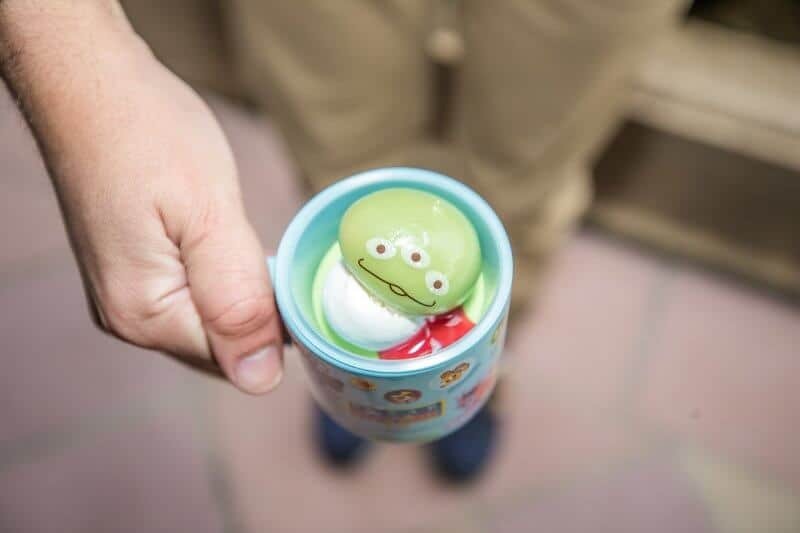 The Green Alien Mochi is the most recognizable snack at Tokyo Disney Resort, and with good reason. They are fun and delicious. 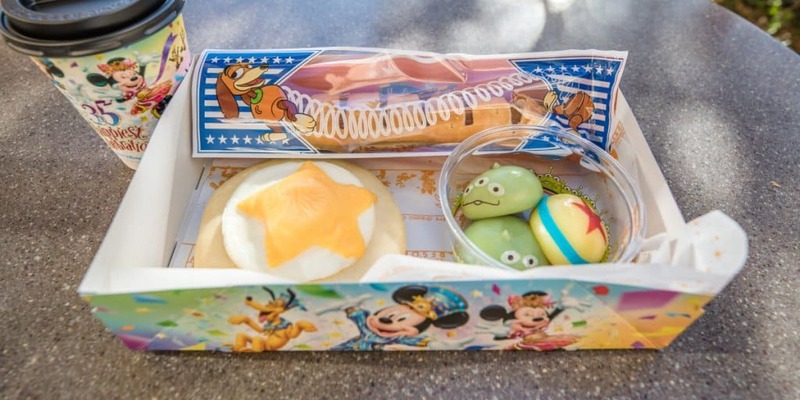 In case you aren’t familiar with what these delectable snacks are, they’re made from pounded rice cakes with cream filling and shaped like the green aliens from Toy Story. Normally, the flavors consist of chocolate, strawberry, and custard (not vanilla, as many people mistakenly suggest). 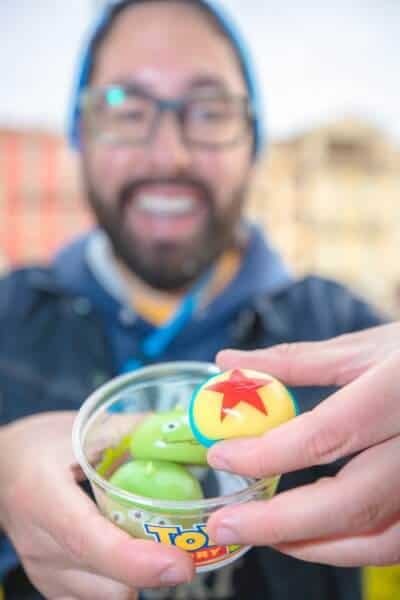 During the Pixar Playtime event, the custard is replaced with lemon cream and the design is the Pixar (Luxo) ball! It’s such a simple thing, but it’s done so well. The lemon cream itself tastes as advertised and is a welcome change to the normal custard. Now, I’m not sure if this flavour is sticking around after the event, so we’ll have to wait and see. I’d be completely on board with keeping this a regular offering as I’m quite a fan of lemon. That’s not all; if you want to splurge a bit more, you can get an awesome souvenir case for your mochi. 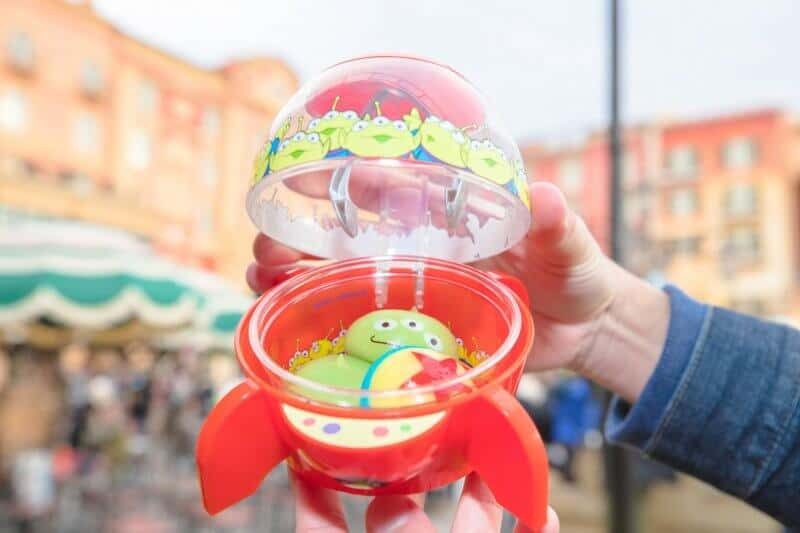 The case looks like the claw machine from Toy Story. But it doesn’t stop there! It comes with a pair of tongs that are THE CLAW. That way, the little green aliens feel as if they have been chosen — to go right into your belly. 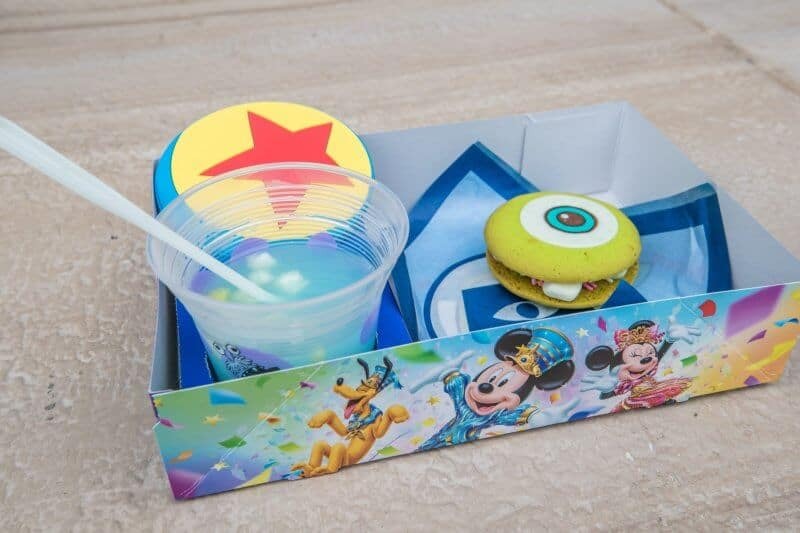 Note: I’m not sure if the lemon-flavoured mochi is sticking around after the Pixar Playtime event (along with the souvenir case). 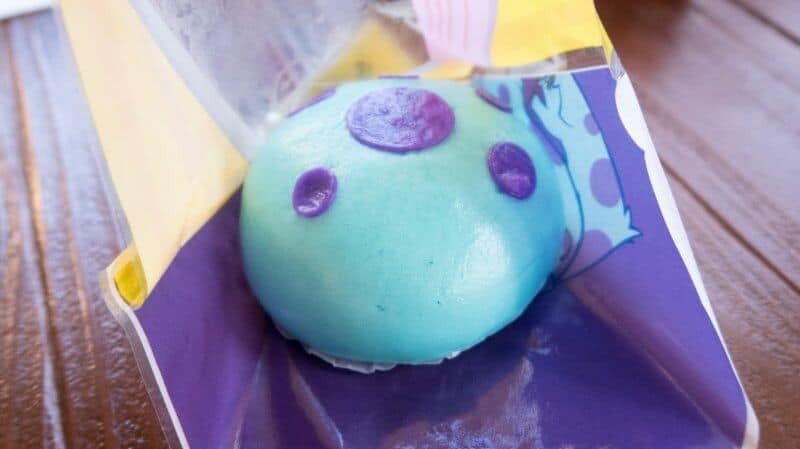 Out of all the food offerings this year, the green alien mochi with the Pixar ball is one of my biggest recommendations. Find this and the souvenir case at Mama Biscotti’s Bakery. You’ll also find these guys at Tokyo Disneyland (choose between 3 or 9). Mama Biscotti’s Bakery offers a pastry set that’s perfect for those who wish to carb-load first thing in the morning. It comes with a sausage pastry, curry focaccia, and three of the green alien mochi (the ones I mentioned above). The sausage pastry came as a surprise for me, as I’m not usually a fan of pastries. The sausage is standard, but the pastry itself is flaky and full of flavour. 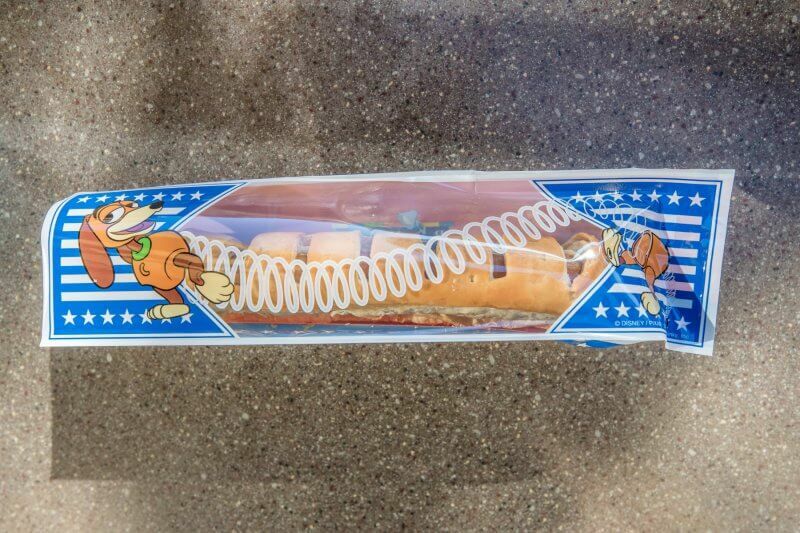 It also helps that it’s well-themed to look like Slinky Dog. The curry and focaccia (Italian flatbread) was another hit. The curry had a bit of a kick to it (it had minced beef) under the star-shaped fried egg. The entire thing looks like the Pixar ball. This is a take on the popular curry bread that is a staple in bakeries throughout Japan. I recommend this as a lighter meal, or if you don’t mind having a lot of carbs. Vulcania Restaurant in Mysterious Island has an interesting Monsters Inc. set. It comes with your choice of fried rice or minced pork in thickened sauce, dim sum, and a coconut mousse dessert. The minced pork was just alright, nothing special. 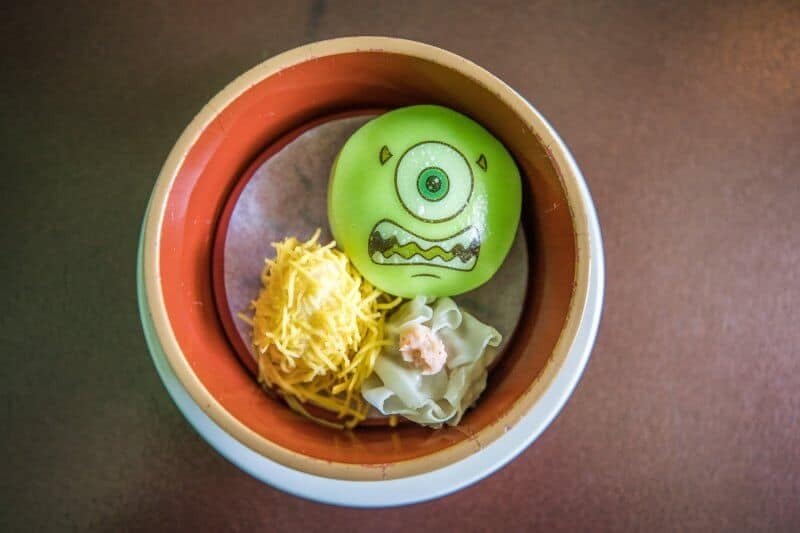 The Mike Wazowski-shaped dim sum is full of pork and vegetables (the same ingredients as the infamous gyoza dog). I quite enjoyed the Mike dim sum more than the other two (shrimp and fish cake). 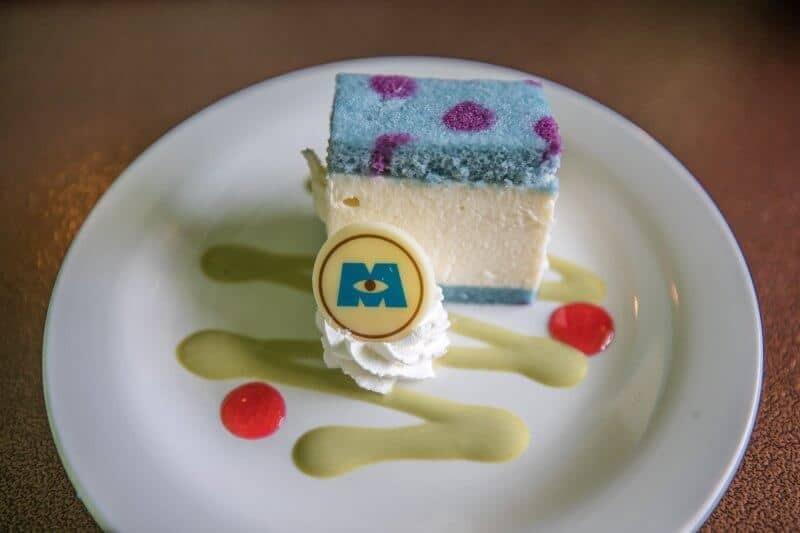 But the clear winner here is the Sully coconut mousse cake. Out of all the desserts I’ve had, this is the absolute best one. I’d skip the set altogether and just have the cake. Seriously. Cafe Portofino has a delicious pasta meal set that is incredibly filling and satisfying. 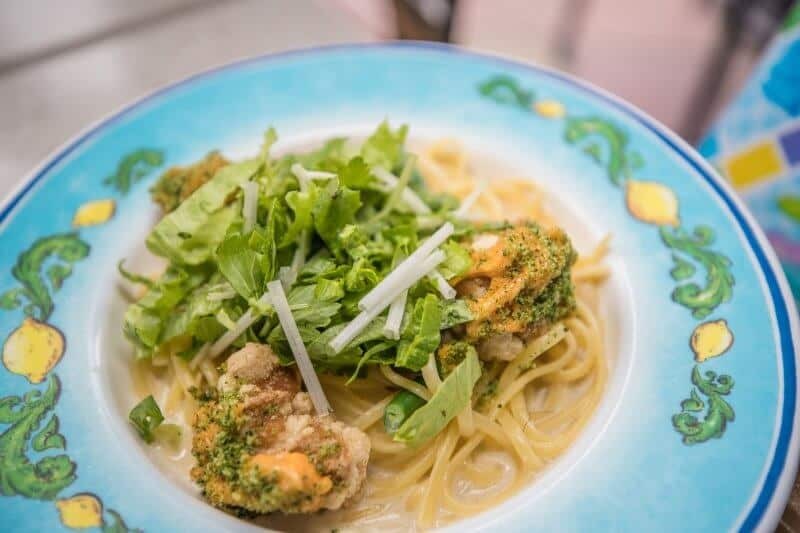 The main comes with fried chicken with lemon sauce on top of vegetable linguine. On the side, you’ll get vegetable soup with sausage, drink, and choice of desserts. 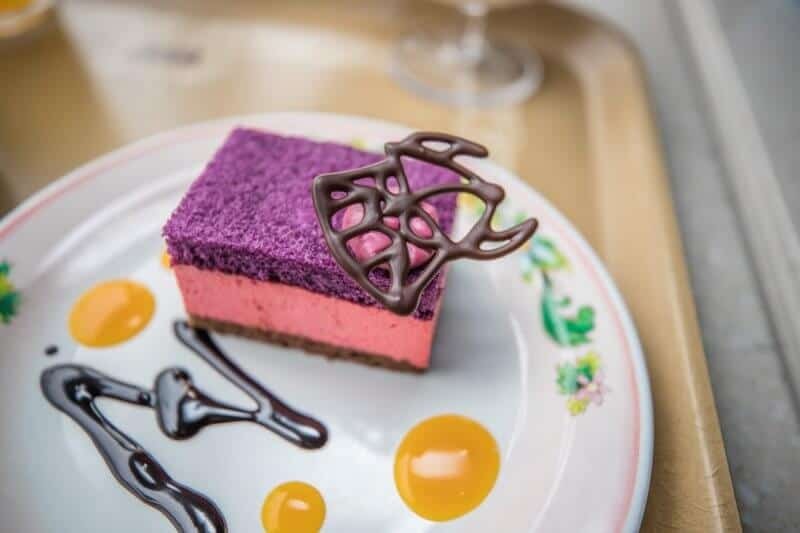 The desserts include a Lotso pannacotta, Emperor Zurg mixed berry cake or a Woody cream roll cake. The fried chicken with lemon sauce was the highlight and my favourite part of the entire dish. 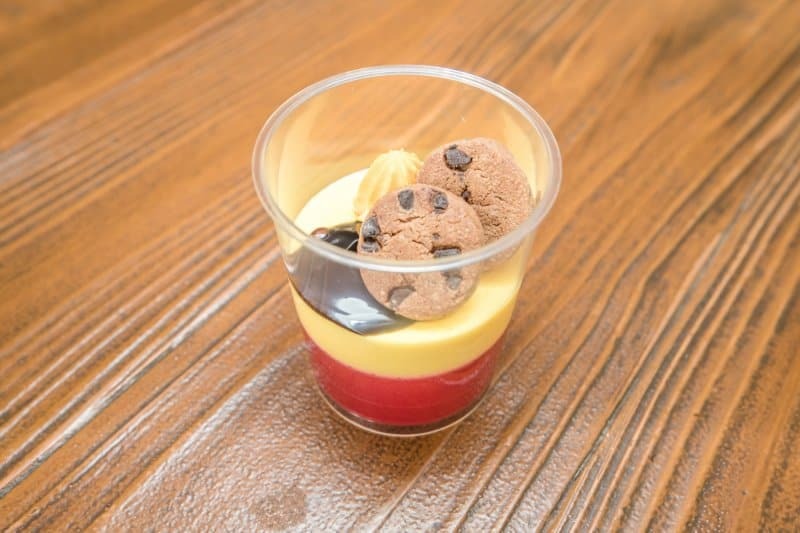 Out of the three desserts, my favourite was the Emperor Zurg, even though the Lotso panna cotta wins in the presentation department. 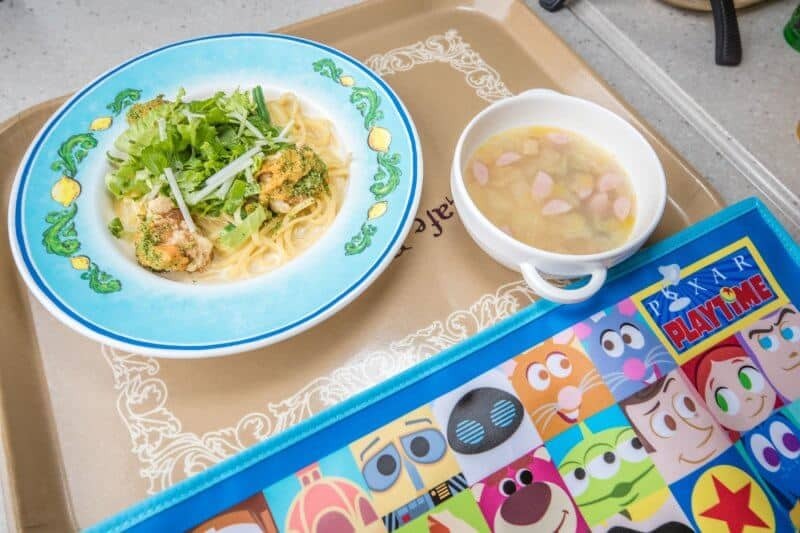 For an extra ¥600 ($5 USD), you can add-on a souvenir lunch mat (which is adorable). Pro Tip: While eating outside, be mindful of the birds as they are ruthless and aren’t shy at pecking at your food. This most definitely happened during our filming of the video. The sukiyaki sandwich from New York Deli was a complete surprise. It’s an odd choice for a sandwich, but surprisingly this is one of my favorite items this year. Sukiyaki is thinly sliced beef cooked in a sauce mixed with veggies (typically leek and onion), noodles, and with a raw egg on top. 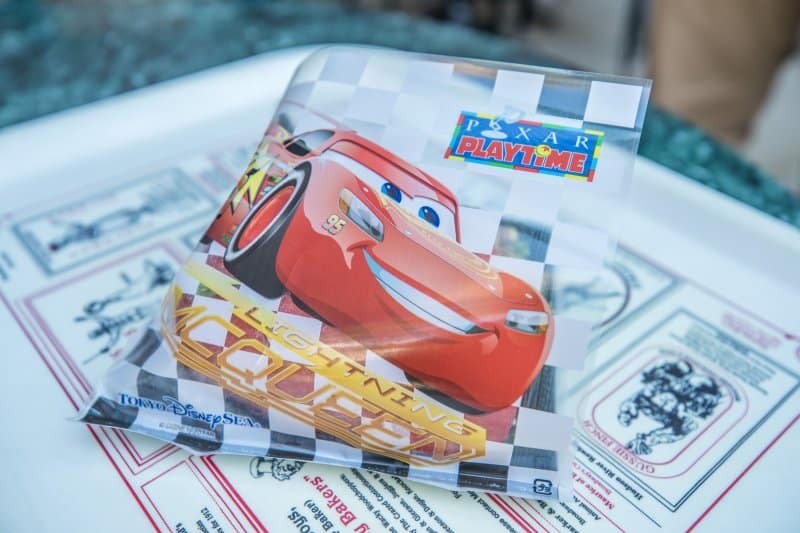 The Lighting McQueen sandwich takes this concept and runs with it, and does it well. Between two red buns are the veggies, beef, noodles, and egg yolk sauce. For those who’ve never had this Japanese dish before, it sounds completely strange. At first, I thought the sauce was cheese since that’s what it looks like, but I knew that cheese wasn’t typically an ingredient in sukiyaki. Eventually, it clicked that the sauce was, in fact, egg yolk sauce. The beef is tender and full of flavour and the veggies give it a nice crunchy texture. The egg yolk sauce isn’t overpowering and complements the beef. It’s a bit messy, so I recommend using a fork to eat it if you’re worried about getting it all over your face. I’d gladly have this again without a doubt. Another odd but delicious meal set is at the Casbah Food Court in the Arabian Coast. 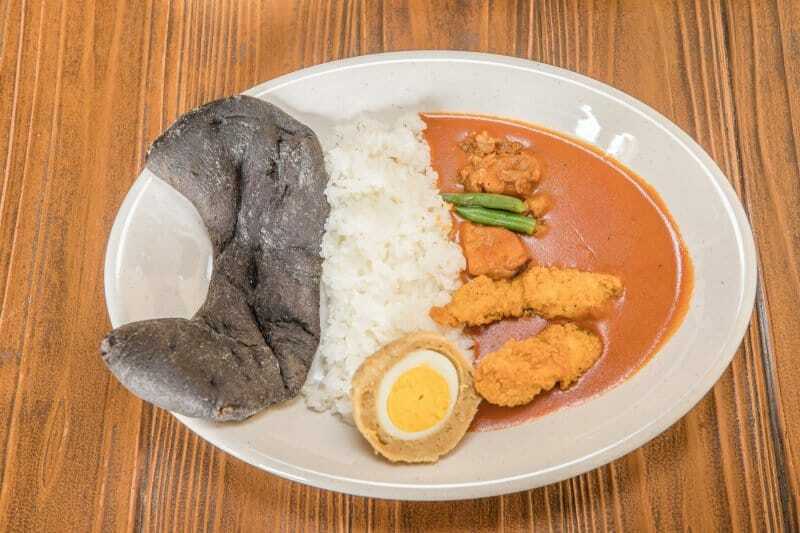 The set comes with red curry (medium spice) with fried chicken (essentially chicken fingers), a scotch egg, rice, black naan bread, and choice of drink. Dessert is a lemon mousse and raspberry jelly with a Jack-Jack motif. The red curry itself isn’t spicy at all. There’s a small kick in the aftertaste, but nowhere near what I’d consider even remotely spicy. I wouldn’t worry about the spice, even if you don’t like spicy food. 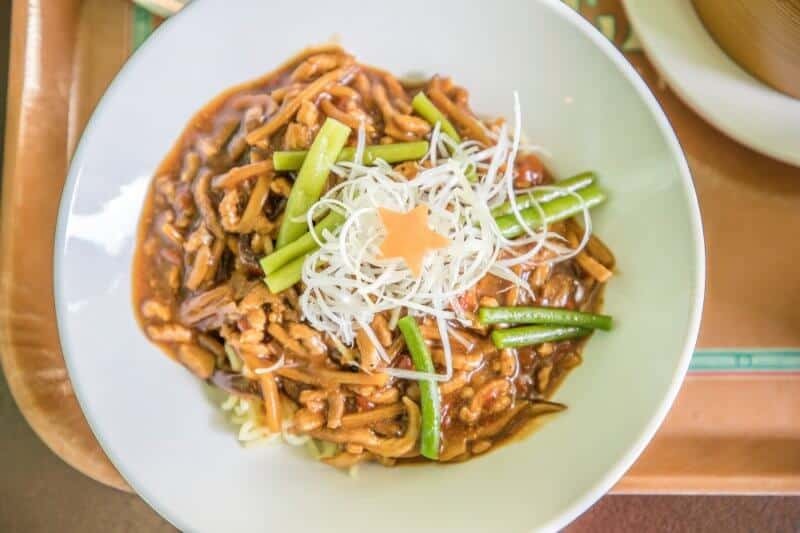 In Japan, spicy food isn’t spicy in comparison to other parts of the world. With that said, the curry is delicious and the fried chicken is an added bonus. 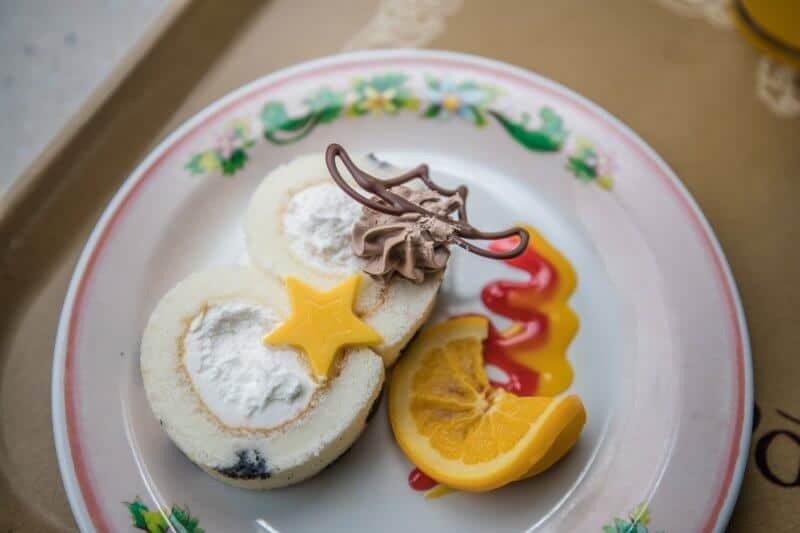 As for the dessert, it’s simple in its flavour, but where it shines is how it looks like Jack-Jack. It’s even topped with two tiny chocolate chip cookies! If that’s not detail, I don’t know what is. 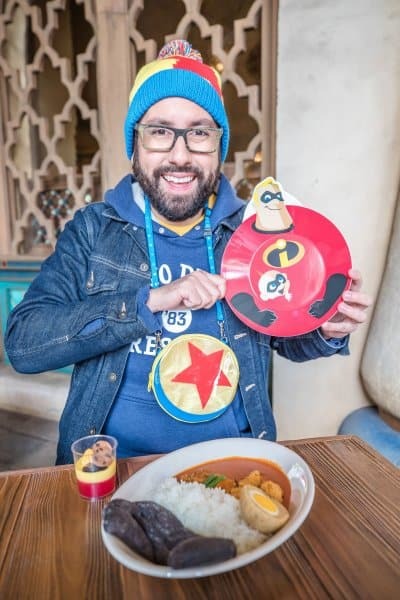 For an extra ¥1,000 ($9 USD), you can get this souvenir curry plate (made of melamine). I’m a sucker for anything practical, and I was in need of a curry plate for a long time. 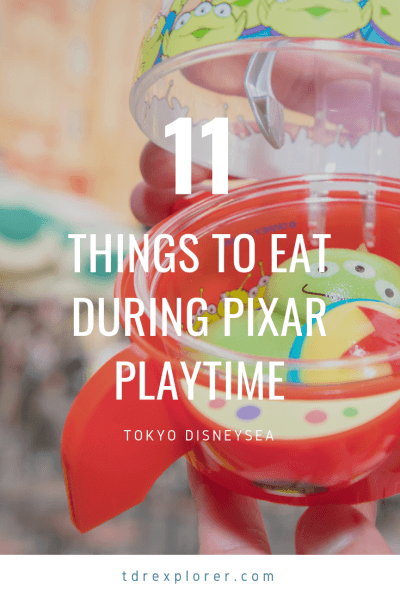 There’s an abundance of snack foods and desserts to try during Pixar Playtime. I’ll share with you which ones I think are worth your hard-earned money. 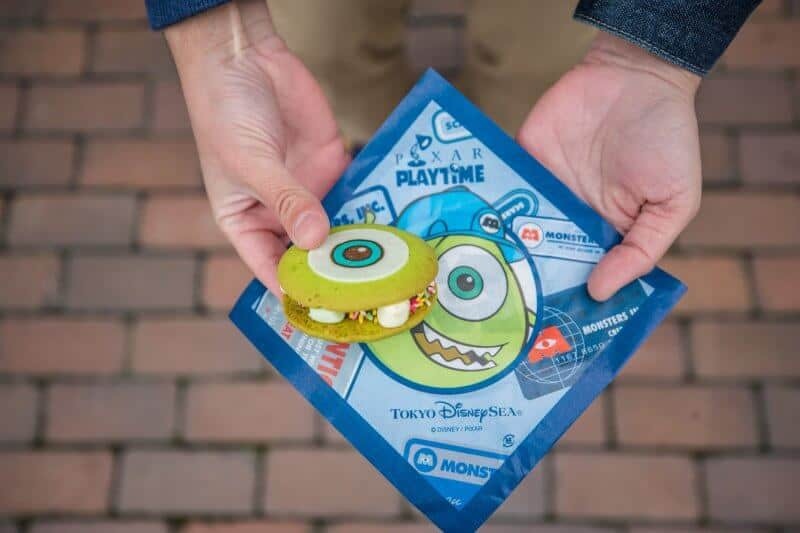 Second to the green alien mochi in terms of cuteness is the Mike Wazowski cookie sandwich. In terms of flavour, the chocolate ganache is the best part. The cookie itself is nice and soft, but nothing “Incredible.” You’ll find this at Hudson River Harvest. 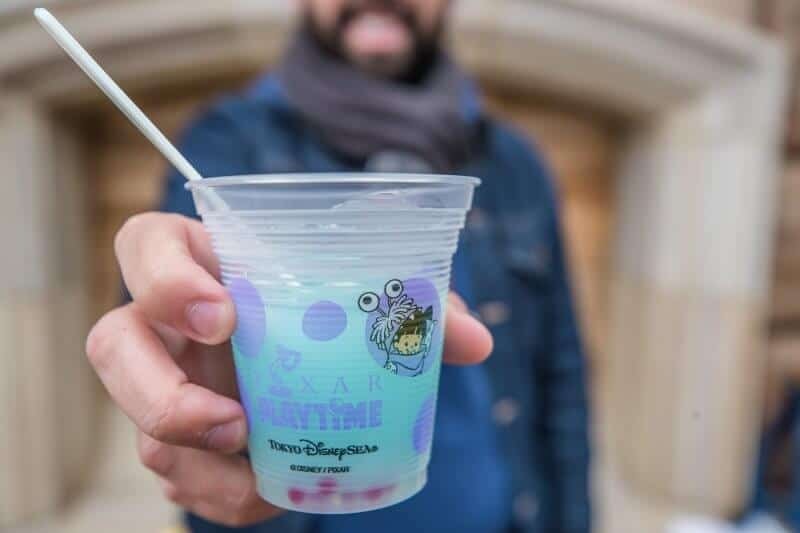 The hot lychee drink isn’t overly sweet and is a nice way to warm up on those cold and windy winter days at Tokyo DisneySea. The chunks of lychee inside are a simple but nice detail. This pairs well with the cookie above (both flavour-wise and thematically). There’s also an optional rubber souvenir coaster too! You’ll find this at Hudson River Harvest. A simple dessert with pistachio, vanilla mousse, strawberry sauce, and a delicious green alien mochi on the top (strawberry). 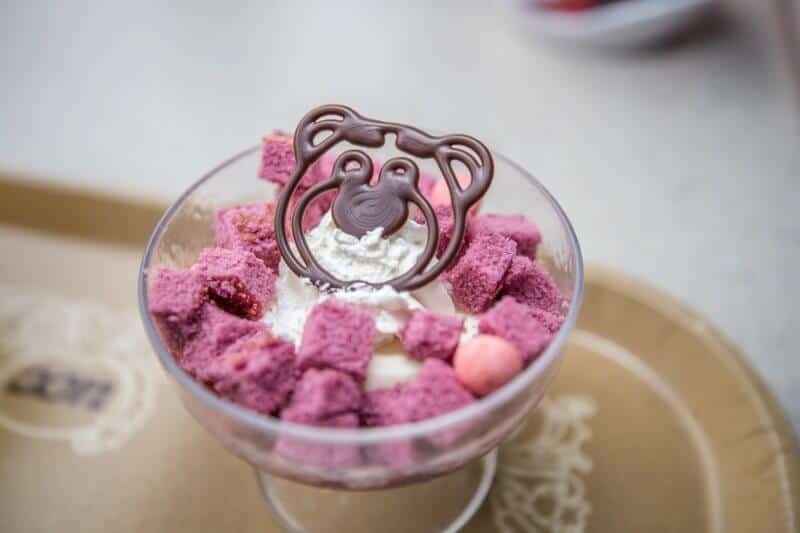 The dessert itself is rather plain, but the cup is adorable! You’ll find this at Mama Biscotti’s Bakery. Another cream-based dessert that’s nondescript in terms of flavour (it’s rather plain). However, the presentation is on point and the souvenir plate is well-designed, too! You’ll find this at Mama Biscotti’s Bakery. 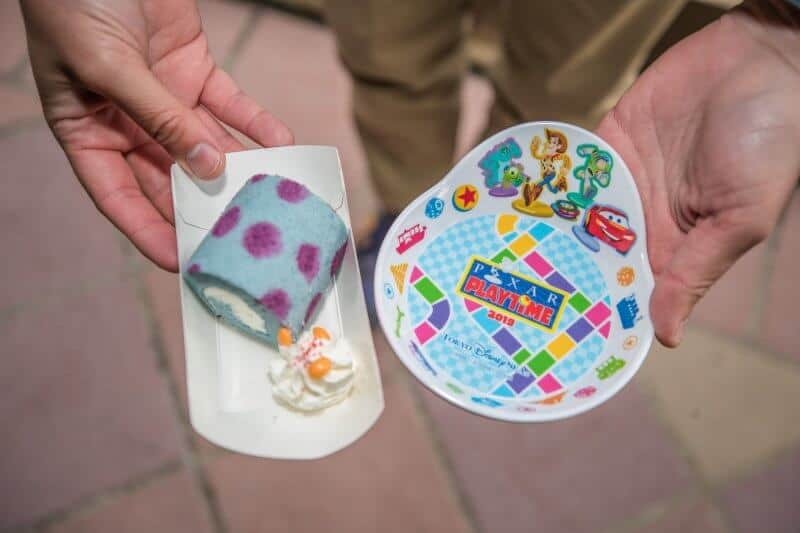 Making a return this year at the Sultan’s Oasis is the Sully steamed bun with chicken and corn inside. It’s a fun snack and a great way to warm up. While the flavour is fine, I am not a fan of the texture of the chicken. That’s just a preference of mine. 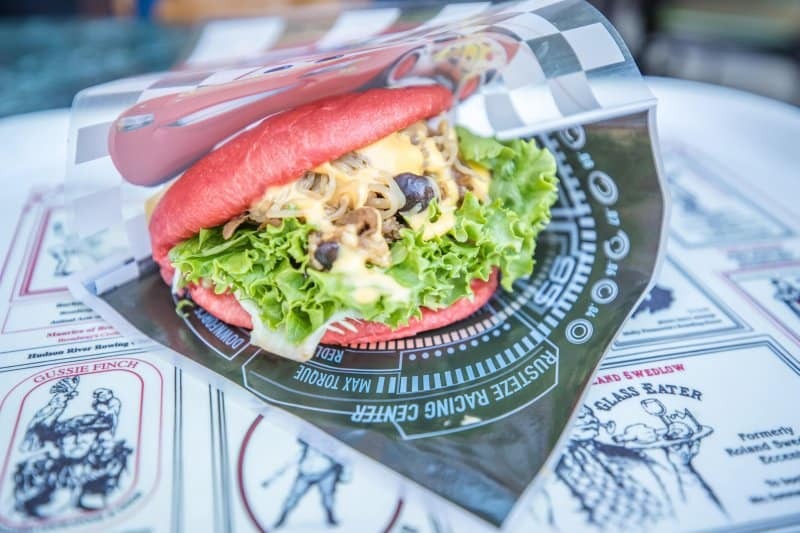 The Chandu steamed bun is still available too! 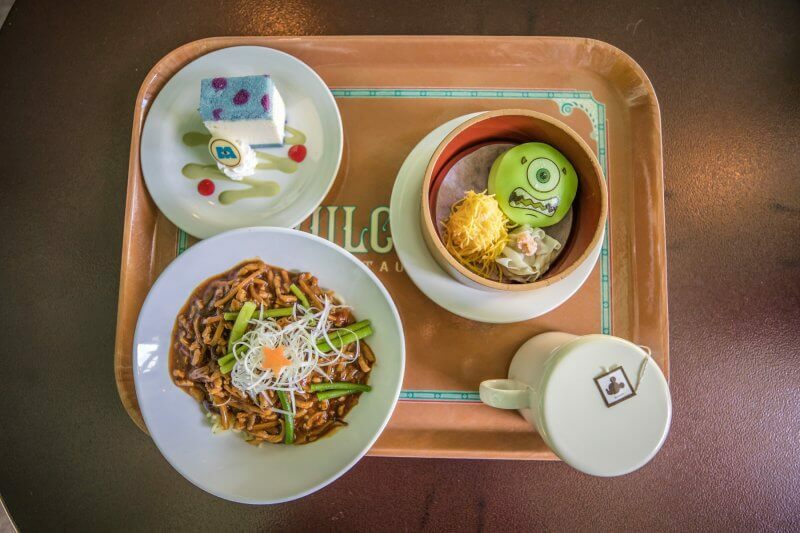 There’s a ton of food to experience this year at Pixar Playtime at Tokyo DisneySea! Does anything in this list tickle your fancy? Let me know in the comments!